The Why Files: Science Behind the News. 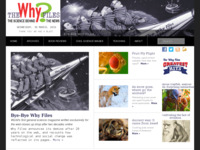 The mission of The Why Files is to explore the science, math and technology lurking behind the headlines of the day, and to present those topics in a clear, entertaining and accessible manner. Although based at and supported by the University of Wisconsin-Madison The Why Files covers science at all institutions that engage in scientific exploration and discovery. The goal is to explain the relationship between science and daily life. The site also includes a Cool Science Image database and a searchable archive.